For years Hungary’s new undersecretary for public health Zoltán Ónodi-Szűcs has been trying to call attention to the fact that the government wastes billions on public health care because the hospitals are not primarily concerned with caring for patients but rather obtaining more money from the National Health Care Fund (OEP) to survive. Ónodi-Szűcs replaces Gábor Zombor who resigned at the end of August for “personal reasons”, although online daily 444.hu claims the latter had been contemplating the move for a while after the government torpedoed efforts to reform the public health care system. Although he succeeded in reducing waiting lists and getting the government to assume hospital debt, Zombor was not able to achieve a reorganization of the institutional system. Nor did he succeed in overcoming opposition from the Office of the Prime Minister to increasing the fees public hospitals are allowed to charge the government for services rendered, at least according to daily online Origo.hu. Zombor’s successor says Hungary’s public health care system is both wasteful and inefficient, providing completely different levels of service at different points around the country. However, he warns that reforms will require sacrifice. At a press conference held on Tuesday the new health undersecretary said “the most important thing is that public health care serve the interests of the public rather than the institutions”. The fight against institutional interests is not a recent phenomenon. So what does the new undersecretary think is wrong with Hungary’s public health care system? Ónodi-Szűcs has a medical degree from the University of Debrecen. Since then he has made a name for himself as an expert in health care management even though he is still working on his PhD at Budapest’s Corvinus University. Before becoming a regional director and later general director of the State Health Care Center (GYEMSZI) in 2012, he served as the director of the Debrecen hospital. Pro-government daily A Magyar Idők (The Hungarian Times) quoted Ónodi-Szűcs at the beginning of October as saying “We have been avoiding this hot topic in Hungary for twenty years, never daring to state what we know, namely that the use of public health care services does not reflect the needs of society but rather the interests of the institutional system”. For years Ónodi-Szűcs has been penning articles for medical publications that point out that there are serious problems with the system of public health care. He wrote his first serious article in 2o1o after Fidesz returned to power, in response to the Semmelweiss plan developed by the then-health undersecretary. Examining with other researchers the health care consumption habits of patients, together they discovered a regional disparity that was much larger than expected. They expected to find that public health clinics in Budapest received the most money from the National Health Fund, and that differences in the cost of health care between regions would not exceed ten percent. The reason underlying this assumption was that if a patient could not receive the necessary treatment at one health care facility, then he or she would seek it at another comparable facility, and that the wandering from institution to institution would somehow even out disparities in health care costs. Instead, they discovered that certain towns received much more funding from OEP than Budapest, and that the total disparity among regions could be as much as 140 percent. They also determined that in the towns with the highest level of health care consumption, people ended up in hospital nearly three times more often than elsewhere. Ónodi-Szűcsék believes variation among communities does not explain such a large disparity unless one community happens to be significantly larger than another. This led him to conclude that the huge differences were the product of “the structure and funding environment of the public health system”. For example, at the time of preparing a study in 2011, Győr had hardly requisitioned funds from the National Health Fund, even as Pécs and other regions in the east had done so extensively. Why so large a disparity? In a subsequent paper Ónodi-Szűcs writes that the reason is clearly because National Health Fund funding contracts concluded between hospitals and health insurers allowed this: “the structure of the services was fixed both in terms of quantity and its overall composition”. What this means is that independent of patients’ ailments and the kind of health care services they require, the hospitals are still interested in providing those services for which they can charge the most according to the contracts. He believes such arrangements to be artifacts left over from an earlier, out-moded system. One such artifact is what is known in technical language as “wad-HBCS” (vatta-HBCS). HBCS is an official method of measuring and refers to a homogeneous group of patients. Simply put, it designates a system for classifying patients on the basis of which the insurance company pays the hospital for services rendered. The term “wad-HBCS” is used for those cases where it is difficult to verify afterwards whether the care was warranted or not. Even though the cost of such procedures to health institutions is small, the National Health Fund pays a lot for such procedures. Illnesses of the eyes and of the kidneys in adults are examples of such treatments. Ónodi-Szűcs’s research indicates that the ratio of “wad-HBCS” services to overall services was much higher in those regions where there was over-consumption of health care. That is not to imply that in those regions everyone is a cheat. But it does mean that the ratios are the largest where the percentage of unverifiable procedures exceeds the national average. In Hévíz, for example, where there was no over-consumption of health care services, wad-HBCS services amounted to 3.5 percent of all services invoiced to the National Health Fund, whereas in Kalocsa, a region of over-consumption, the ratio reached 17.7 percent. Researchers believe hospitals falsify figures with regard to the number of surgeries they perform. Ónodi-Szűcs believes a hospital can save money by providing as many services as possible that do not require surgery, in which case it is not necessary to make use of operating rooms, anesthesiologists or intensive care. He believes there is little point to raising the so-called “hospital performance volume’ (TVK), that is, the value of operations a hospital may perform in a given month, in the hope of reducing waiting lists, because it is in the hospital’s interest to spend as little as possible of the increased funding on surgery as this a way it can save money. “Naturally the institutions try to serve the patients, so it performs those operations required by the community it serves. At the same time, if there is a chance to save money because the TVK allows this, then the remaining capacity is spent almost entirely on low cost, quasi-profitable cases,” writes Ónodi-Szűcs. Fewer operations results in longer waiting lists. However, he points out that the number of cases not requiring surgery increases in regions characterized by over-consumption. (We certainly hope for the sake of any of our readers that require hospitalization that they can follow Ónodi-Szűcs’s logic because frankly we can’t make heads or tails of it. According to Ónodi-Szűcs, the secret to improving public health care facilities is to defund them.-ed). So what conclusions did the new health undersecretary draw from all of this? On the one hand, that the disparity due to over-consumption is huge. Nationalizing the hospitals does not solve the problem. (Ónodi-Szűcs is presently the director of the government office responsible for administering Hungary’s nationalized hospitals and public health care clinics, although he was not at the time of his study). This anomaly is not only a problem because it violates the principle of equal access to public health care, but also because if the government increases public funding of the system, it will not necessarily result in better services, only a better economic condition of the institutions in question. (All of which begs the following question: Aren’t adequately funded hospitals more likely to provide better quality services than underfunded ones?-ed). Ónodi-Szűcs believes disproportionate consumption wastes HUF 60 billion each year. “For my part, the facts merely demonstrate that the current structure is capable of consuming any amount of funding without achieving breakthrough results and without any institutional actor feeling satisfied. And yet patient and health care employee satisfaction, which is urgently needed, will remain a dream without buildings, technology, and higher wages,” he wrote in a study this year. 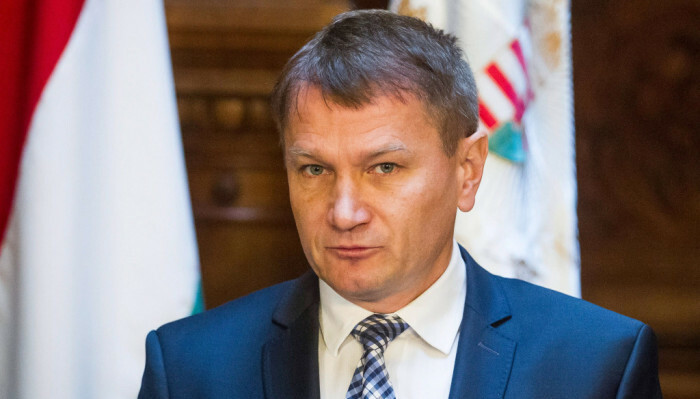 Speaking at Tuesday’s press conference on the tasks before him, Ónodi-Szűcs said he would improve basic health care services and develop an institutional incentive system. He announced that while the government would probably not introduce a so-called “life course model” for health care industry employees (providing them with steady pay increases over the course of their careers), he announced that there will be a collective contract for the sector, and that negotiations with stake holders had already begun. On the subject of hospital debt, he announced that the use of public funds is presently determined by “institutional interests”, and for this reason it is difficult to say whether the available resources are excessive or inadequate. The first step is to assess patients’ needs, says Ónodi-Szűcs, adding that once that task is completed, it will be possible to determine what resources are required. Inquiries should be directed to inquiry(at)budapestbeacon.com. Letters to the editor should be directed to letters(at)budapestbeacon.com. The Budapest Beacon is an online news publication committed to fact-based reporting about what is really happening in Hungary. The Budapest Beacon is published by the Real Reporting Foundation.